Despite the global downturn last year, the Penang property market has not recorded any significant drop in prices and is expected to improve this year in line with the economic recovery. 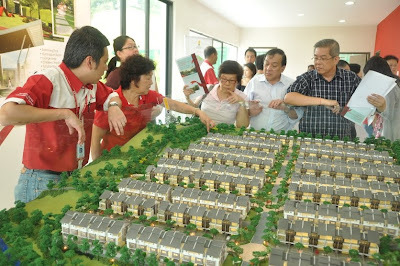 Henry Butcher Malaysia (Seberang Perai) Sdn Bhd's senior manager Fook Tone Huat said that development land, especially in Seberang Perai, were still in good demand, particularly those near town areas. "Although many projects were deferred last year, we are confident that the worst is over and and the public confidence has began to come back in the property market," he said at a media briefing on the property market in Seberang Perai, Butterworth, today. The Seberang Perai area is expect to record a 10 per cent increase in appreciation rate due to its high population density compared to neighbouring states like Kedah and Perak, Fook said. "No doubt that Penang Island has been the number one choice for property but Seberang Perai can offer a better price and location," he said. Fook said that development land in Seberang Perai were two times larger than those in Penang island. "The lack of land for development has caused properties in Penang island to be about 40 per cent higher than those in Seberang Perai," he said. According to Fook, now is the time for the public to purchase properties as the base lending rate (BLR) is still below six per cent. "As long as the BLR is below six per cent, it would not affect the number of purchasers in the property market," he said. On the outlook for 2010, Fook said the residential sector will still be the main player in the property market in Seberang Perai and among the hotspots to be developed are Raja Uda, Bagan Lallang, Juru, Bukit Tambun and Simpang Ampat. As for commercial properties, he said Bandar Sunway in Seberang Jaya will continued to be the prime hotspot and there is potential for new shop office development in the area. 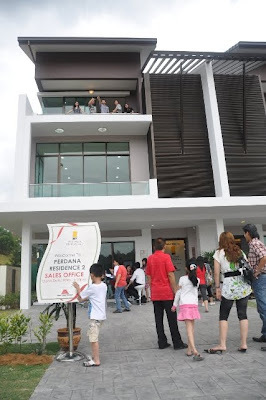 Mah Sing Group unveiled its Perdana Residence 2 show units to more than 500 registered visitors on 13 March. At the exclusive preview in Selayang, guests toured the show houses and gave positive feedback on the spacious lay-out, impressive design, as well as high quality finishings. The show units are now open to public from 10 am to 5pm daily. At the preview, the Group showcased 3 storey superlink homes with land sizes of 22’/24/ x 80’ and approximate built up of 3,182sqft and 3,400sqft priced from RM868,800 onwards for intermediate units. Each home with high ceilings of 12 feet, has six en-suite bedrooms and two utility rooms, a wet and dry kitchen and is equipped with a smart home alarm system. Perdana Residence 2 is a gated and guarded project containing 268 units of three storey superlink homes targeted at families who are looking for contemporary resort living in a safe and secured environment with its 2.5metres high perimeter fencing integrated with infra red CCTV and fiber optic sensors. To ensure its residents enjoy a healthy living, there will be a Clubhouse with swimming pool, gym, BBQ area, children’s playground and other amenities. The Group has also conceptualized a thematic red ribbon leisure park within the project to create a tropical resort ambience with lush greeneries. The project is located in the heart of Selayang with easy accessibility via a network of highways and trunk roads including the Middle Ring Road 2, Jalan Kuching, Selayang-Kepong Highway and the Rawang Highway. From the project, there is easy access to FRIM (Forest Research Institute of Malaysia), Bukit Lagong Forest Reserve, Selayang Hot Spring, Templer hills and KL Metropolitan Park. For more information on the project, please call 03-9221 6888 or 012-235 5002. PETALING JAYA: PPH Resorts (Penang) Sdn Bhd has filed a counter claim against SP Setia Bhd unit Setia Promenade Sdn Bhd which recently filed a writ of summons and statement of claim against the former to recover its project advances, interest in the advances and development project expenditure incurred. PPH was claiming RM5.72mil and “damages alleged to have been suffered” to be assessed by the court, SP Setia said in a filing with Bursa. Setia Promenade had filed a suit against PPH after terminating the joint venture (JV) agreement between the parties following a thorough assessment of the proposed development on 45-acre freehold land in Penang, citing among other reasons, failure of common purpose of the JV agreement. SP Setia said Setia Promenade had advanced about RM12.2mil to secure the release of some of the affected lots and incurred development project expenditure in pursuance of the proposed JV. It said the JV was announced in December 2006 and it stated that said Setia Promenade would was to provide the initial funding for the development of the land and these that shall be treated as advances to the JV. According to the agreement, Setia Promenade shall be entitled to charge interest at the rate of 8% per annum on the advances and shall have the right to create encumbrances over the land to secure the advances and interest on the advances. PPH had filed a counter-action on March 12 for, among others, the recovery of the sum of RM5.72mil and damages alleged to have been suffered to be assessed by the court. “The legal action is not expected to have a material adverse impact on the earnings and the net assets of the company,” the company said. MALTON Bhd wholly-owned subsidiary Pioneer Haven Sdn Bhd has entered into a joint development agreement with Bukit Jalil Development Sdn Bhd for the development of a mixed commercial and residential project. The project has an estimated gross development value of RM2.5 billion. In a filing to Bursa Malaysia today, it said the proposed development will be carried out and completed in phases over a 10-year period. Malton said the joint venture was in line with the company's expansion plan of its core business activities of property development, construction and property investment. It said the proposed joint venture is expected to contribute to the medium and long-term profitability of the company. KUALA LUMPUR: Ho Hup CONSTRUCTION Co. Bhd's subsidiary is teaming up with MALTON BHD 's unit to develop a piece of freehold land, measuring 243,000 sq metres (approximately 60 acres) into mixed commercial and residential development. Under the agreement, Ho Hup said on Wednesday, March 17 the project would comprise of shopping complex, shop offices, office tower, service apartments and hotel. The joint development agreement (JDA) is between Ho Hup's Bukit Jalil Development Sdn. Bhd (BJD) and Malton's Pioneer Haven Sdn Bhd. BJD would be entitled to a minimum of RM265 million from the joint development. "Given that BJD is facing financial constraint and inability to secure the financing to proceed for the development, hence, the JDA will allow Ho Hup, through BJD, to generate revenue and profits without having to fund the development. "In addition, in the absence of any refinancing options, the entry into the JDA presents a viable alternative to restructure the amount owing to the existing charge and avoid foreclosure of the land," it said. The ever-rising prices of property in Penang are not just down to scarcity of land but are partly due to speculators, strong demand from investors and a low-interest rate environment. Dr Michael Lim Mah Hui, senior fellow of Socio-economic and Environmental Research Institute (Seri), a think tank, said the investors comprise wealthy Malaysians and foreigners. The price rise is making property increasingly out of reach for the average Penangites. The strong demand means that developers were putting more expensive price tags on their projects. Lim, a banker who worked with Credit Suisse, Standard Chartered Bank and the Asian Development Bank, said from 1999 to 2008, the prices of property in Penang rose 40 per cent. This increase is a tenth more than that for the whole country, and it is still going up. Terrace houses in Penang now average RM700,000 to RM1.2 million, against RM445,000 to RM520,000 two years ago. "Condominiums cost RM250 per square feet in 2008 but now the price is RM350 to RM500, depending on the location," Lim said during Seri's roundtable on housing affordability gap in George Town last week. However, it is not surprising if entire development projects are sold out in two days now as buyers are easily taken in by attractive down payments as low as 1 per cent and the low interest rates for housing loans, he said. The public may not fully understand the risks of adjustable-rate mortgage (ARM) when they sign up for loans, for example. An ARM gives low rates at the start of a loan but the rates go up after the promotional period. "Such a situation can result in a (real estate) bubble, which nobody can tell when it will happen," Lim said. He said certain developers were not helping the situation by reserving the best units for their "special customers". "Some developers let their prime customers and insiders cherry pick the units they want first before everyone else. "When the average house buyers visit the developers' sales galleries at the project launch, they find many units had already been sold, encouraging many of them to quickly make down payments for the remaining units as well," he said. Lim expressed concern that there is a mismatch of supply and demand for properties in the state with many houses, flats and apartments vacant. He said in 2000, there were 355,436 housing units in Penang but only 284,969 households, indicating an oversupply of 20 per cent. "Since then, more units have been built. If you go round at night, you will notice that many homes are unoccupied, especially super-condominiums that are beyond the affordability of average households. "This is also an indication that there is an undersupply of affordable housing in the state," Lim said. He proposed that the state government study how Singapore's Housing and Development Board managed its public housing. Penang Development Corp should also undertake more land reclamation to develop more affordable homes.